Buying phones during the holiday season is a lot of fun, especially when you can get in on some huge savings. Samsung, for instance, is discounting its Galaxy S9 and Galaxy Note 9 models to the tune of hundreds of dollars off. If you buy a phone that’s unlocked, you have the luxury of choosing which carrier you use for service. Before you run out and sign up with the big name carriers, do a little bit of homework. Spend some time and you might find that you can get just as good of coverage but at much cheaper rates. One carrier we’ve profiled here, Mint Mobile, may be just the ticket. It’s backed by T-Mobile’s network but offers considerably lower rate plans. And, best of all, things are even cheaper for Black Friday. Normally, Mint Mobile has rates that start as low as $15 per month and include 2GB of high-speed data. Indeed, there are also 5GB and 10GB data plans to choose from, too, and they’re quite affordable. 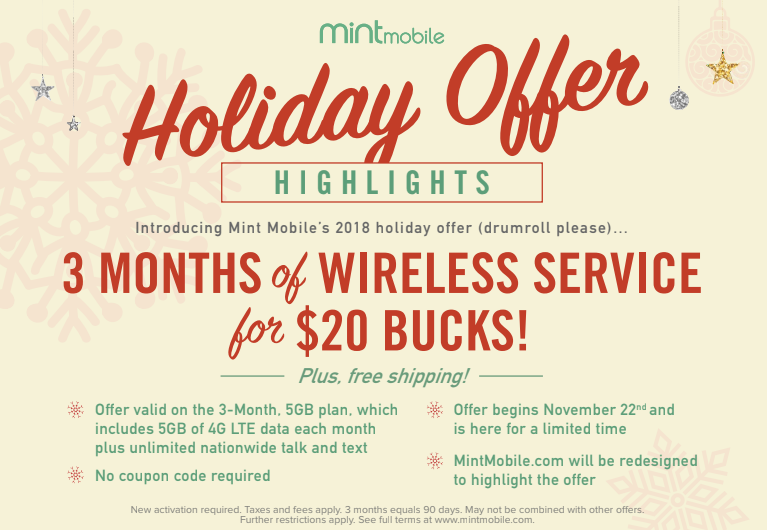 Starting on Thanksgiving, Mint Mobile is offering customers three months of wireless service for just twenty bucks, plus free shipping! The offer is valid on the 3-Month, 5GB plan, which includes 5GB of 4G LTE data each month plus unlimited nationwide talk and text. Moreover, there’s no special coupon code required. The Black Friday deal starts at 12AM EST on Thursday, November 22, 2018. It isn’t exactly clear how long this promotional rate plan will last so be sure to hop on it if you’re interested. After all, there’s a 7-day money-back guarantee.